With great fanfare during the Super Bowl, a Google ad touted a job search tool for America's veterans, calling them "the 7 percent that keep the rest of us safe." Google drew praise for lending a hand to those who served. But veterans say that tool may not help them find the high-paying jobs they hope for. And Google remains tight-lipped on its own hiring of people who served in the military. 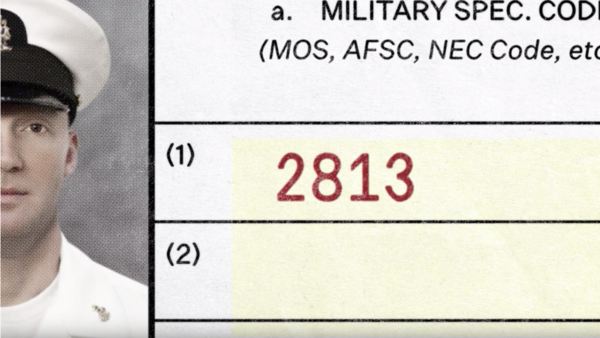 The ad begins with numbers and letters that make no sense unless you've served in the military — special codes that define jobs in the armed forces. There's a search underway for "jobs for veterans 12B," with 12B being a combat engineer. And the search locates well-paying civilian positions — an operations manager, civil engineer and construction manager. "No simple code can define who you are," narrator John Krasinski says, "but now, it can help you search for whatever's next." Colleen Deere is executive director of American Corporate Partners, which helps veterans find civilian jobs. Deere said the Google tool is hardly new; these kinds of code translators have been around for decades and with mixed results. Sometimes they might encourage vets to apply for jobs beneath their skill sets. Deere's husband tried to use one of these codes when he transitioned from military to private work in 2010, she said. "It told him that he was well-suited to be a security guard and he's now working on a trading floor at an investment bank. So for him it was a little bit deflating, to say the least," she said. But Deere said more than 80 companies have partnered with her organization to help mentor and train veterans for the workforce. "We're definitely on an upswing in terms of corporate America realizing that this is a big issue," Deere said. Google launched its job search tool in August 2018 after sharpening it with veterans within and outside the company, a Google spokesperson said. It's part of a wider veteran focus at Google that includes a $2.5 million grant to the USO to train 1,000 transitioning service members and military spouses in IT. Each year Google releases a diversity report that lists employee numbers by gender, race and ethnic background. However, the company does not release numbers for how many veterans are in its workforce. The spokesperson said in a statement that the company is "looking into ways we could collect and share" statistics on veteran hiring. Google's appeal to veterans comes as the tech industry faces rising calls to diversify its staff; white and Asian men hold the lion's share of leadership positions at Google as well as across Silicon Valley. Mona Lisa Faris, publisher of U.S. Veterans Magazine, said other major companies have committed to hiring and retaining specific numbers of veterans. Walmart has hired more than 200,000 veterans; Verizon, Comcast, Boeing and Hilton have all made commitments to hiring and retaining more than 10,000 veterans, she said. Her magazine has listed all those companies on its list of top veteran-friendly companies for 2018. Google did not make the list. "I believe that to be branded as veteran-friendly, a company must be transparent in their veteran hires. By disclosing the number of veteran employees, transitioning veterans will want to join Google's workforce, while other Fortune 500 companies will be encouraged to increase veteran employment," Faris said in a statement. Faris said a tight labor market may be pushing corporate decision-makers to look for new talent. In 2010, the jobless rate for veterans was 8.7 percent, according to the Bureau of Labor Statistics. By contrast, as of January 2019 the unemployment rate for veterans was 3.7 percent. That is lower than the overall unemployment rate of 4 percent. Those numbers may be deceiving, according to Lindsay Rodman, director of communications at Iraq and Afghanistan Veterans of America. In a recent survey the organization conducted, more than a third of veterans who served after the Sept. 11, 2001, terrorist attacks considered themselves underemployed, she said. "The biggest challenge is that our veterans are both under- and over-qualified for the jobs they apply for," Rodman said. "They often feel like a square peg trying to fit into a round hole. The military will have developed certain leadership, organizational, management, and other skills better than any private sector company ever could. At the same time, the specific skills of the job they move into won't perfectly replicate whatever they were doing for the military." Critics of the Google tool pointed to its shortcomings and suggested other ways the company could help veterans. John Motter, a community organizer who describes himself on Twitter as a Marine combat veteran, noted that California, where Google's Mountain View headquarters is located, leads the nation in homeless veterans. "Pay your taxes," he tweeted. CA leads the nation in homeless veterans. Pay your taxes. Rear Adm. Dan Kloeppel founded Corporate America Supports You to match veterans with employers. He cautioned that many ex-soldiers either don't want to or can't physically continue the same line of work as they did in uniform, which limits the use of a code translator. Still, he said the Google ad will bring vital recognition to the needs of veterans making the change into civilian work. "The attention will help veterans," Kloeppel said. "The tool itself will be either helpful or unhelpful depending on the type of transition ... of the veteran."